Stoke had been one of the favourites to sign him from the start but just a few days earlier there had been some doubts as to whether that would happen when the two clubs couldn't agree on the finer details of the transfer. The fee was believed to be more than £25,000 making it the biggest fee received since the sale of Brian Pilkington to Bolton two years earlier. Mac himself admitted to being happy to finally have the opportunity to be settled again after all the speculation over his future and he was expected to make his Stoke debut against Norwich but would be having a watching brief for their FA Cup tie at Leeds for which he was not eligible. Mr Gordon Taylor, the Stoke chairman, arrived at Turf Moor around 7:45 p.m. along with his manager Tony Waddington. McIlroy arrived soon after and the three were engaged in a meeting with Lord and Burnley manager Harry Potts. McIlroy then spent an hour with the Stoke pair before agreeing to the deal which would net him £300 players' transfer fee because he had not asked for a transfer. After it had all been done, McIlroy said: "I am very glad it's all over and all settled. I'm very happy with the terms that have been offered me in every respect. I shall be living in Burnley but I don't know yet whether I will be doing any more training at Turf Moor." That last bit might take some explaining but back then it was common practice for players to continue training with their former clubs after a transfer if it proved to be a more suitable option. The sale meant Burnley had netted around £140,000 in transfer fees in a four year period. 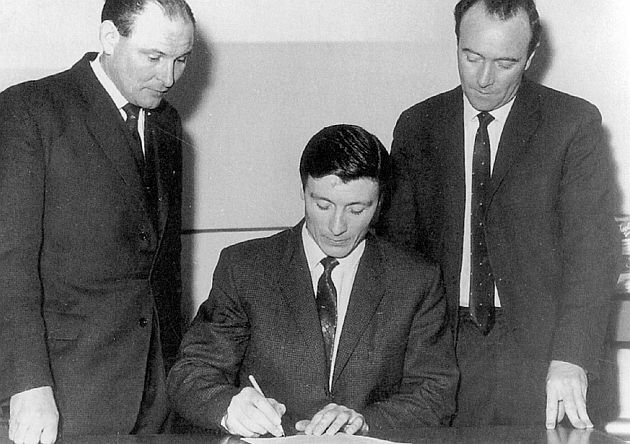 Albert Cheesebrough joined Leicester in June 1959 for £20,000 and we'd also sold Pilkington, that fee was, like McIlroy's, around £25,000 when he went to Bolton. Added to those were Jim Furnell, to Liverpool for £15,000, Ian Lawson, to Leeds for £20,000 and Ronnie Fenton, to West Brom for £17,000. We'd also received around £18,000 collectively for the sales of Bobby Seith, Doug Newlands, Billy Marshall, David Smith, Billy White and Jimmy Scott. Jimmy McIlroy joined Burnley from Glentoran in 1949 and made his First Division debut at Sunderland in October 1950. He went on to play 439 league games, scoring 115 goals. With cup games he fell just three games short of 500 for Burnley. He played in the Championship winning team, in the European Cup and in an FA Cup Final for Burnley. During his time at Turf Moor he won 51 of his 55 Northern Ireland caps. Last week, discussing this being fifty years ago with an old friend I asked him how much more difficult it would have been to win the league without Jimmy Mac. His answer was to the point: "We wouldn't have won it." The McIlroy era was over. The likes of him we'll never, ever see again playing for Burnley.